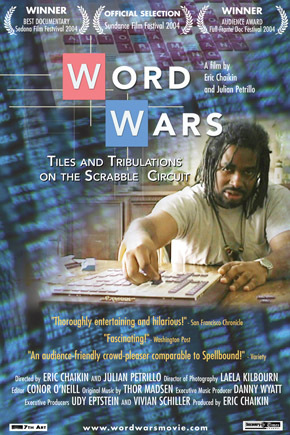 "Word Wars" follows the lives of four of the top-rated Scrabble players in the country as they crisscross the United States in heated competitions culminating in their ultimate quest - the twenty-five-thousand-dollar top prize awarded at the national tournament in San Diego. Defending champ Joe Edley, known as the Jack Nicklaus of professional Scrabble, has memorized the dictionary many times over. Matt Graham, a stand-up comic, takes a lot of 'natural drugs' to aid his concentration. Marlon Hill despises the English language for stripping him of his African identity. 'G.I.' Joel Sherman (the G.I. is for gastrointestinal) downs copious amounts of Maalox. With its tongue firmly planted in cheek, "Word Wars" uncovers the fiercely competitive, highly idiosyncratic world of professional Scrabble. Warning: This is not your grandmother's game of Scrabble. Chaikin is a producer, actor, and published authority in the field of "recreational linguistics" (wordplay) that appears as a character in “Word Freak.” Formerly a software executive at a major Wall Street technology firm, he is an expert tournament player himself, with first-hand knowledge of the characters, their lifestyles, rivalries, rituals and reverence for the game.